At the beginning of the year, the DAX sustained the upward trend of prior years only briefly, and then came under increasing pressure. In particular, the marked downturn of early indicators in the Eurozone and another interest rate hike by the U.S. Federal Reserve weighed on equity markets. Strong U.S. economic data and a four-year high in oil prices made for a mild upswing in the second quarter. The ECB announcement that it would not make any interest rate changes for the time being was also received positively. At mid-year, the DAX began to move sideways. Continuing political uncertainties surrounding the trade conflict between the United States and China, as well as Brexit, put a strain on growth over the rest of the year. Strong U.S. labor market data and China's plans for a more expansive fiscal policy and lower import duties managed to cushion this downward trend only for a short time. At the end of the year, weaker economic data from China and lowered profit expectations of a large number of DAX and MDAX-listed companies led to falling stock prices. Both indices hit their low point for the year on December 27. 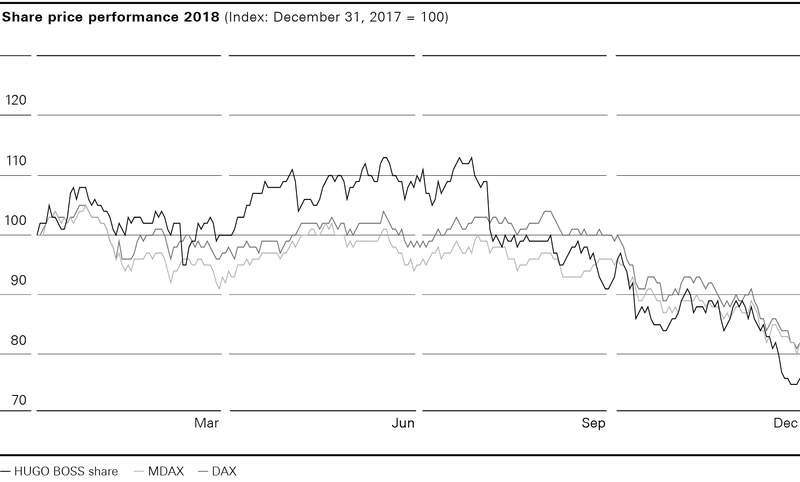 At the end of the stock market year, the DAX and MDAX showed a decline of 18% compared to the closing price for 2017. Based on closing price (December 31). Based on net income attributable to shareholders. Stock exchanges: Xetra, Frankfurt/Main, Stuttgart, Duesseldorf, Hamburg, Munich, Hanover, Berlin/Bremen. At the beginning of the year, the HUGO BOSS share benefited from the publication of preliminary sales figures that were slightly above market expectations. In March, this upward trend was halted by the financial outlook for 2018, which fell short of expectations. Nonetheless, the HUGO BOSS share ended the first quarter better than some competitors and indices. In the second quarter, the HUGO BOSS share benefited from strong Company results and a general recovery of European equity markets. As a result, the shares reached their high for the year at EUR 80.02 in mid-June. In the second half of the year, the apparel industry suffered under an extraordinarily hot and long summer in Europe, which caused some competitors to lower their forecasts for the year. This, as well as persistent worries over a slowing of economic growth in China, burdened the stock prices of the Company and its peers. HUGO BOSS shares saw a recovery in mid-November when mid-term financial targets were announced at an investor day. Ongoing political and general economic tensions continued to put pressure on stock markets as the year went on. In particular, the last few weeks of the year were dominated by political tensions and uncertainties on the stock markets. HUGO BOSS shares were caught up in this general trend as well. Consequently, the stock was listed at EUR 53.92 at the end of the year. That represents a 24% decline compared to the prior year's closing price. The MSCI World Textiles, Apparel & Luxury Goods Index, which tracks the share price performance of key companies operating in the apparel and luxury goods segment, forfeited about 6% in 2018. The Company received several voting rights notifications from investors in the reporting period from January 1 to December 31, 2018. The Company published the original wordings of these notifications on the corporate website at financialreleases.hugoboss.com. The Company regularly conducts analyses of the shares held in free float with a view to addressing the institutional investors investing in HUGO BOSS in a more targeted manner. Thus, 98% of the shares were assignable in the most recent analysis. Besides the regional distribution of the shareholder structure, the analysis also makes it possible to determine the proportion of shares held by private shareholders. This proportion fell slightly from 14% in the prior year to 11% in 2018. Based on the share register, the Company estimates the total number of its shareholders currently at around 35,000. At the end of the year, the HUGO BOSS share, which is listed on the MDAX, reached the 52nd place in Deutsche Börse’s ranking calculated on the basis of market capitalization adjusted for free float, based on the total of companies listed in DAX, MDAX and SDAX. The HUGO BOSS share ranked 43rd by trading volume. The weighting of the HUGO BOSS share in the MDAX at the end of December came to 1.6% (December 31, 2017: 2.1%). On average, around 315,000 shares per day were traded on Xetra in 2018 (2017: around 340,000). HUGO BOSS pursues a profit-based dividend policy that allows the shareholders to participate appropriately in the Group’s profit development. Between 60% and 80% of the Group’s net income is to be distributed to shareholders on a regular basis. The Managing Board and the Supervisory Board intend to propose to the Annual Shareholders’ Meeting on May 16, 2019, a dividend of EUR 2.70 per share for the fiscal year 2018 (2017: EUR 2.65). The proposal is equivalent to a payout ratio of 79% of the Group’s net income attributable to the equity holders of the parent company in 2018 (2017: 79%). The proposed dividend takes into account the positive development of the Group's net income in particular. Assuming that the shareholders approve the proposal, the dividend will be paid out on May 21, 2019. Based on the number of shares outstanding at year-end, the amount distributed will come to EUR 186 million (2017: EUR 183 million). For HUGO BOSS, good capital market and corporate communication means communicating current developments within the Group promptly and in a transparent manner. In 2018, the Managing Board and the Investor Relations team visited 16 domestic and international conferences and spent 25 days at roadshows. In addition, the Company presented its mid-term financial targets in London in November 2018 as part of an investor day. The Investor Relations website group.hugoboss.com/en/investors of HUGO BOSS AG is an essential tool for achieving this as well as regular personal dialog with national and international institutional and private investors. It features detailed information and key figures on the Group, as well as webcasts of important presentations of the Managing Board, among other things. HUGO BOSS investor relations work was recognized in various ways in the past year, including a first-place award in the “Consumer Discretionary” category at the prestigious IR Magazine Awards (Europe). The Company took home another first-place award in the “Best Investor Event” category for its investor day organized at the Company’s headquarters in Metzingen in 2017.